I'm easily spooked. I mean, everything scares me. Not just spiders and insects. Not just jumping out of a plane or running out of coffee. My fears and worries? They're never-ending, and they consume me all day long. However, there is something that frightens me even more than all those things. Certain scary movies stay with me long after I've left the theatre. There are scary movies that I can watch that don't spook me much after viewing, like Friday the 13th, Scream, or Halloween. Other movies, though? Haunt me, years later. What do you get when you combine Stanley Kubrick and Stephen King? One hell of a scary movie. Whenever I walk down a long hallway in a hotel, trying to get to my room late at night, I think about certain scenes from The Shining. 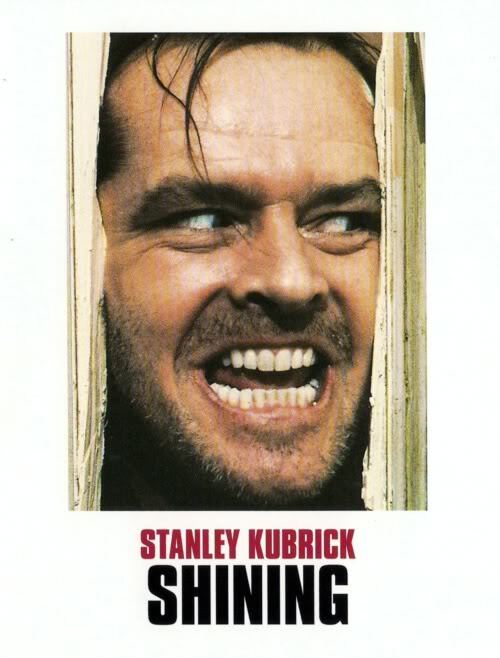 Jack Nicholson was amazing in this movie, and The Shining was one of the only Stephen King novels that did well on the big screen, right after Stand By Me. The movie haunts me to this day. Kids are usually not creepy looking, but this movie made me terribly afraid of kids. Twins, in particular. This movie is hands down the scariest movie I have ever had the displeasure of seeing. I don't know what possessed me to see this movie in the theatre in the first place, but having seen it only once, I am still completely freaked out. I don't do well watching movies having to do with the supernatural or the paranormal. The drive home from the movies that night was an especially scary drive home. I kept looking in my rear-view mirrow to see if that creepy little boy would be staring back at me. This movie changed the way I do things at home. I can't open a closet until the lights are on and I can't leave any doors open at night, because I'm scared I'm going to see that freaky little face. I hate this movie and the images that are forever etched in my mind. 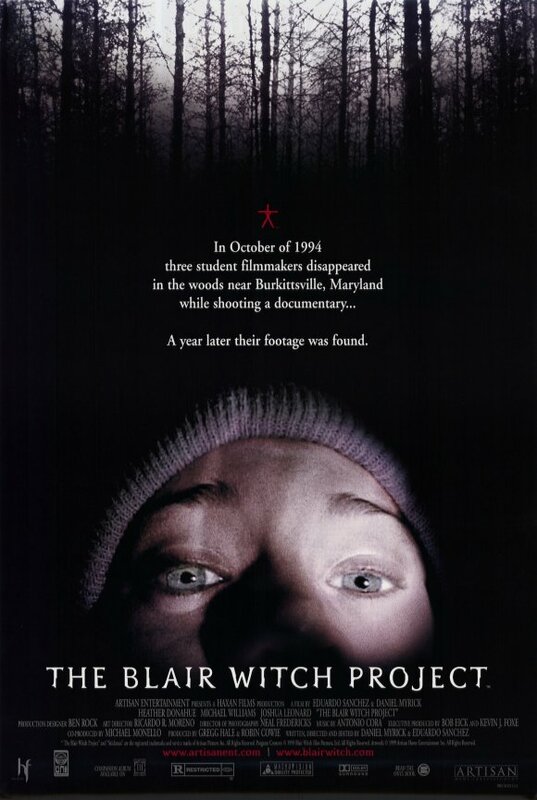 Before Facebook and Twitter existed, a little film called The Blair Witch Project was created. In 1994, three college students went into the woods in Maryland to do a film project about the "Blair Witch" incidents. They were never seen again, and the film was "footage" from their equipment that was found a year later in the woods. The movie documents their adventures leading up to their final minutes. I think we all knew it wasn't really real, yet, I've never left a theatre that was so silent before. The last few minutes of this film are incredibly frightening, and confirmed to me what I already knew: I'm never, ever going camping in the woods! There are scary movies about haunted houses, and there's Paranormal Activity. I never wanted to see this movie, because I knew if I did, I'd become even more paranoid than I already am. One night, though, it was on TV and I could not look away. That was a big mistake because now I can't even be on the main level of my house with the lights off. If I need water, I'll drink from the bathroom sink, something I'd never think about doing before this movie came along and screwed up my mind. Paranormal Activity is so scary, (I get chills just typing that) I can't imagine seeing the other two. However, a part of me does want to see Paranormal Activity 3 to see just how bad it could be. Apparently, the last 15 minutes will, and I quote, "screw you up for the rest of your life." What movie scares you silly? What movie do you swear you'll never see again? Was there a movie you saw that changed the way you now do things, because it's scared you so much? Oh, and Happy Halloween. Or whatever you're supposed to say on this spooky day! No movie scares me, but the Paranormal Activity movies do a great job of setting up atmosphere. I think that Blair Witch was another good one. Also, Deuce Bigalow: Male Gigolo was pretty terrifying. How can The Exorcist not be on that list. If I watch it, I have to sleep with the lights on. too funny. G and I have been trying to watch something SCARY. We have tried unsuccessfully for the past few weeks. 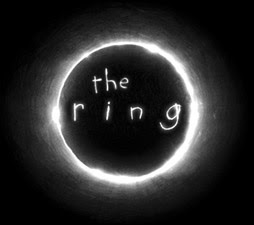 The only movies that have REALLY REALLY scared me are The Ring and The Shining. Silence of the Lambs disturbed me to no end. I slept in my parent's bed for a week after that and I was already 19!!!! The only one of these I've seen is Blair Witch- which didn't scare me b/c I knew it was fake- but the second one was messed up! The commercials scare me. I won't even consider watching the movies. Really, the last scary movie I saw was The Sixth Sense and I'm still not over it. Blair Witch scared the crap out of me. To this day, I have nightmares about the guy standing in the corner. And Paranormal Activity. Yeah. That hit close to home. After I saw that movie, I walked out of the theater and said, "that was me." Having said that, I find myself drawn to those kinds of movies. I went back and saw PA2 and I can't wait to see PA3. I'm sure I'll regret it when I can't sleep, but I'm a glutton for punishment. OK, I'm easily spooked too and I've only seen 2 of those. I HATE scary movies, they stay with me entirely too long! I hate scary movies and I saw two of those: The Ring and The Grudge. EEEK checking behind me as I type that there aren't any creepy chicks behind me. I once wrote a post titled "If I Could Take it Back" about things I wish I had never done. It wasn't a long list, but watching The Ring was on it. I remember watching that girl crawl out of the TV and realizing that my mouth was open in the same silent scream as the dead victims. So. Scary.